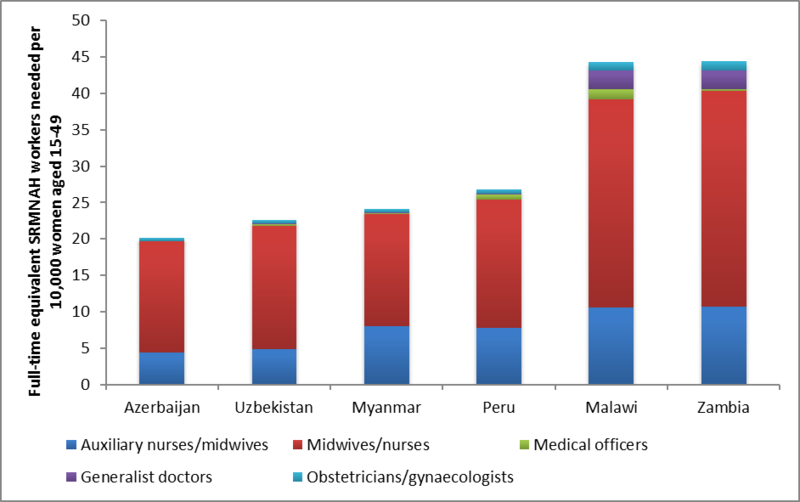 A More Accurate Method for Estimating Country-Level Health Workforce Needs? An effective health workforce requires not only a sufficient number of workers, but also an appropriate mix of health care providers or cadres. Many of the current models estimating health workforce needs do not adequately address demographic and epidemiological diversity among countries—differences that affect the types of providers and skills needed. To develop a model that takes these demographic and epidemiological characteristics into account, a group of researchers recently published a paper describing a new method for calculating sexual, reproductive, maternal, newborn and adolescent health (SRMNAH) workforce needs. ⇒ Step 1: Estimate the total number of full-time equivalents (FTEs) required to provide universal coverage of all the key interventions in a given year. This step requires identifying the number of women, girls and babies requiring each essential SRMNAH service, which takes into account the demographic and epidemiological profile of a certain country’s population. The authors identified essential practices by consulting the Partnership for Maternal, Newborn and Child Health’s list as well as the practices recommended in the 2014 Lancet Midwifery Series. Step 1 also involves calculating the length of time needed to deliver each intervention and converting the total annual contact time into equivalent amounts of full-time effort. ⇒ Step 2: Allocate the annual number of FTEs required to deliver each intervention to a cadre with the relevant competencies. Community health workers (CHWs) were not included in the analysis due to a lack of international consensus around the definition and qualifications of CHWs. Next, the authors used the International Standard Classification of Occupations and the World Health Organization’s “Optimize MNH” guidelines to determine which interventions each cadre is qualified to perform. An algorithm was used to allocate the FTEs needed for an intervention to each cadre of health workers. ⇒ Step 3: Estimate the annual number of FTEs of each cadre category required to deliver the SRMNAH interventions by stage on the SRMNAH continuum of care—pre-pregnancy, pregnancy, labor/birth or postnatal—and by institutional level of care—primary, secondary or tertiary. Using this model, the researchers calculated the ideal health workforce size and mix for six countries with diverse population-specific needs. Notably, these projections were substantially higher than those proposed in the 2014 State of the World’s Midwifery Report. This model yielded an ideal ratio of between 1.7 and 1.9 midwives or nurse-midwives per 175 births. In all six countries included in this analysis, midwives and nurse-midwives can meet the majority of the need for SRMNAH workers. Obstetricians/gynecologists and generalist doctors are needed for more specialized SRMNAH services. This model may be helpful for health workforce planning, particularly in countries with limited resources. In addition to these calculations, however, policymakers must ensure equitable geographic distribution, adequate education and training and strong, supportive health systems to enable health workers to provide high quality care. Check out other posts in this blog series. Learn more about the global maternal health workforce. Are you interested in sharing your perspective on issues related to the maternal health workforce? We want to hear from you!